Good reviews continue to increase in importance for small businesses – the new Word of Mouth. Recently, a Facebook friend of mine posted a photo of a local gas station along with a blistering review regarding the service she received. I recognized the business from the photo, and since this friend is reliable, I decided – however subconsciously – to mentally file her review for later refererence. There’s an excellent chance that I won’t be stopping to purchase gas for my car at that particular station. For better or worse, your business could be receiving this kind of review on social media outlets like Facebook and Google+, whether you know it or not. And for a local small business, these kinds of reviews are a big deal – social media is the new Word of Mouth. And sooner or later, somebody somewhere is going to be unhappy with the service he or she receives at your place of business and may leave a bad review that, since it’s online, lasts for-ev-er. So how do you protect yourself? Focus now on offense! Build up a wealth of good reviews that will cushion those rare bad reviews you may receive over time. At Verticalwerks, we’ve come up with a few useful ways to help our clients get the good reviews that they need. Surprisingly, however, there’s a wide range of small business owners who don’t ask for referrals at all – the same goes for reviews. This is a mistake. To build up a store of good reviews, you’re going to need to ask. This can be accomplished through simple conversation during the course of business in which you refer to your Facebook business page, or if you hand out a card or piece of paper with verbiage that includes “Like Us on Facebook!” and how they can find you. Regardless of how you decide to ask for good reviews…YOU MUST ASK. One of our clients has come up with a way to grab a review from a customer before that person ever leaves his business. While he uses an ipad with Facebook and Google+ already up and ready for a review, you don’t have to go out and buy one. Grab a computer that’s sitting in your garage or back office – or find a cheap one locally – and set it up in the entrance. 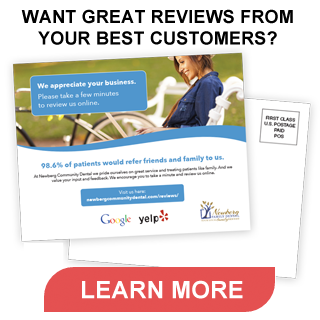 Dedicate it to gathering reviews from your customers before they ever leave your business! A service we are beginning to offer to our clients includes a handy-dandy counter display with QR codes that connects customers with the Facebook and Google+ business pages. This allows customers to scan the QR codes with a mobile phone and leave a review on either page while standing in your office! By the way, a referral is the highest compliment we can receive. And Like us on Facebook!